You may play this spell when an opponent would use a unit or Phoenixborn ability that is not inexhaustible. Cancel the effects of that ability for the remainder of this turn. If you use Hypnotize on a Unit it gains Bypass. The FAQ states that you can use Choke to cancel the effect of Bypass. 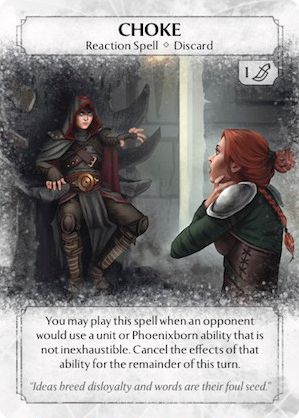 Sadly the FAQ states that modifying an ability of a card is a special case of affecting the card, so Holyknight with Bypass can not be choked, as the Impenetrable ability prevents Spells from affecting the Holyknight. An Elefantrider with Bypass however can be choked as he has no such protection.